Today is Halloween, when people dress up in scary costumes. I have decided to show the opposite. What could be more pleasing and less scary than flowers and butterflies? The flowers around our condo provide abundant opportunities for photos. This type of flower looks similar to a bird of paradise, except it has what appear to be little orange-yellow teeth growing up from the center of the flower. path along side our Langosta condo building. We can walk out the back gate directly to the beach, but the building developers also installed this path along side the building to the beach for others to use. The wetlands in and around estuaries are habitat for lots of animals, including fish, birds, crocodiles, mammals, and crabs. The crabs must provide food for other animals, as they are rather cautious about straying from their home. This crab kept his eye on me and stayed where he could dash back down his hole if I looked threatening. Today is Sunday, so we have new photos posted on our Viva la Voyage travel photo site. This week we are showing some additional photos from our trip to Cambodia earlier this year. We want to go back and see more. The photos will help show you why. I have shown photos of people fishing, including yesterday's photo. So I guess that it should not be surprising that some one created a wood carving of a fish. People usually create art based on objects in their lives and environments. This week we have photos of Peggy's Cove, Nova Scotia, posted on our Viva la Voyage travel photo site. This fisherman is bringing in his net to gather in a few fish scooped out of the current at the mouth of the Langosta estuary. I did not see him bringing in large fish, but he was certainly catching more fish than people who use a rod and reel. I don't know why, but the man in yesterday's photo left the water and jogged down the beach. I don't know why. Maybe he saw me taking photos and thought he would run in front of me to make for a better photo. Some people swim in the tidepools along Playa Langosta, although I prefer to go to a nearby area where there are no rocks and the waves roll in on the sand. On a warm day, and most days are warm days, this does look like a refreshing way to cool off. 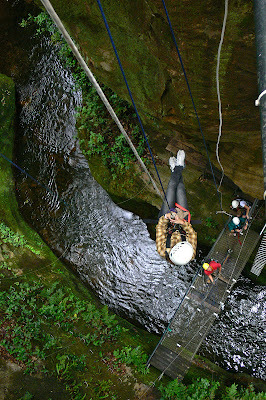 I would not want to leave anyone hanging after yesterday's photo of a young woman repelling down to the river. She landed safely on the platform, as did my two sons and I a few moments later. This photo shows the process of repelling down the cable from the upper platform to the platform jsut above the river, which I showed yesterday. This activity was fun on a variety of levels. It was unusual, beautiful scenery. It as a day outdoors in nature. And it expanded one's experiences by doing something new. Young people love it. And even folks like me (I am over 60) can do it. I took this photo from a platform over the river, looking down onto a platform that straddles a narrow canyon. You see a cable on the right. That cable is the method of getting from the platform where I am to the platform where you see people below. 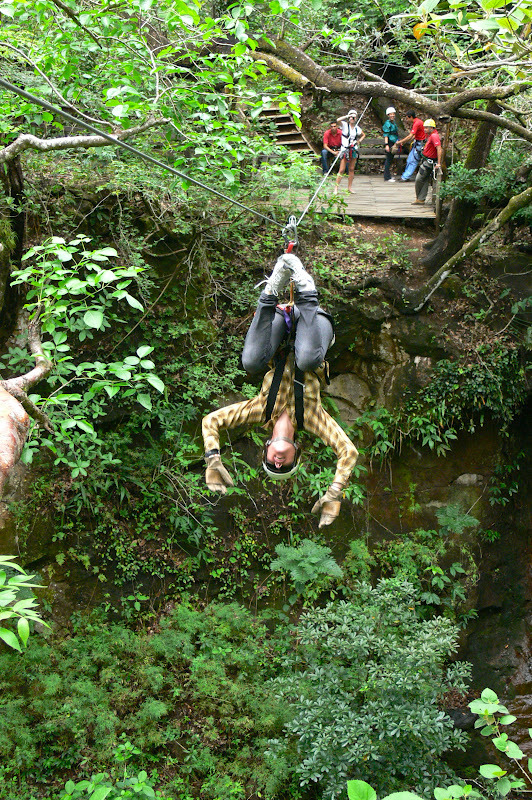 This is part of the zip lining course at the adventure tour of Hacienda Guachipelin, about 90 minutes northeast of Tamarindo. At this point in the course, you repel down towards the river. The next step is to do a Tarzan swing across the river. Today is Sunday, so we have new photos posted on our Viva la Voyage travel photo site. This week we are showing photos of Peggy's Cove, Nova Scotia, a very picturesque spot. Zip lining is plenty thrilling enough for me. I have no need or desire to add even more thrill by zip lining upside down. Others, such as this young woman, are more adventurous. We are showing photos of the main temple complex of Bangkok, Thailand on our Viva la Voyage travel photo site this week. 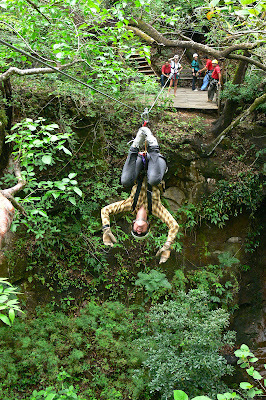 This zip liner demonstrated that she was flying through the trees with no hands. 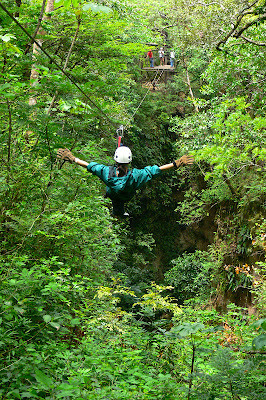 Maintaining some contact with the cable with the thick leather gloves that they give you while zip lining is advisable because the gloves are also the method of slowing down as you approach the landing platform. If you apply friction to the cable with the gloves too soon or too firmly, however, you will stop before reaching the other platform and will have to pull yourself along the cable. That does not happen often, nor for very far, as most people would rather come in a little fast and let the attendant catch you than pull yourself along the line. I turned around again while photographing the sunset and look who joined us! A coati came walking along the road. They are relatives of raccoons and are peaceful. They do not bother people. It was at the end of sunset and was getting rather dark, so I had to lighten this photo, which degrades the quality. When taking photos of the sunset, it pays to turn around and see the sky in the opposite direction. That is what I did for this photo, with the clouds in the Eastern sky catching the color from the sunset that I showed yesterday. We stayed for dinner at the El Caracol Restaurant overlooking the golf course at Papagayo, so we also took in the sunset over the Pacific. Julie asked that I stop the car while we were driving down the Papagayo Peninsula so she could take a photo, which I was happy to do. I was lazy and stayed in the car, but that does not mean that I cannot take photos, also, as I caught a glimpse of her from my side view mirror. The Papagayo Golf Course is spectacular. It traverses the crest of the Papagayo Peninsula and offers views of both the Pacific Ocean on one side and the Gulf of Papagayo on the other side. No, I have never played golf there. We have eaten lunch at the restaurant overlooking the golf course several times. Visitors need to call the Four Seasons Resort at least a day in advance to make a reservation, otherwise you cannot even drive onto the peninsula. Today is Sunday, so we have new photos posted on our Viva la Voyage travel photo site. This week we are showing of the main temple complex in Bangkok, Thailand. Vegetation in Costa Rica can be dense, but this ivy is not thick like the outfield wall at Wrigley Field. Nevertheless, I like the pattern of this ivy growing up this colorful wall. In fact, the color reminds me a little of the color of the sunset and sea in my photo yesterday. This week we are showing photos of the Khmer temples of Cambodia on our Viva la Voyage travel photo site. No, my title of crimson tide does not have anything to do with the Alabama football team. I took this photo from our Langosta condo balcony just a few moments after the photo of the sunset that I showed yesterday. The sun was still in the sky, so I zoomed in on the ocean below the sun the capture the sunset reflecting off the sea. I did not adjust the exposure or saturation of this photo in the computer. This is how the camera captured the scene. When taking some sunset and sky photos, I will underexpose the photo a little by increasing the shutter speed or f-stop, as it makes the colors deeper and richer. This week we are showing photos of the Khmer jungle temples of Cambodia on our Viva la Voyage travel photo site this week. I am using this photo of the sunset from the balcony of our Langosta condo to report the sad news that the sun has set on the print edition of the Tico Times after 56 years. It succumbed to the economic challenges that have faced many newspapers around the world. More and more people are getting their news on line, and the costs of printing and distributing the traditional newspaper are too much in an era of declining advertising and subscription revenues. Hopefully, the newspaper will find enough revenue sources from its on-line edition to continue to support its excellent reporting. The Tico Times is an English language publication. 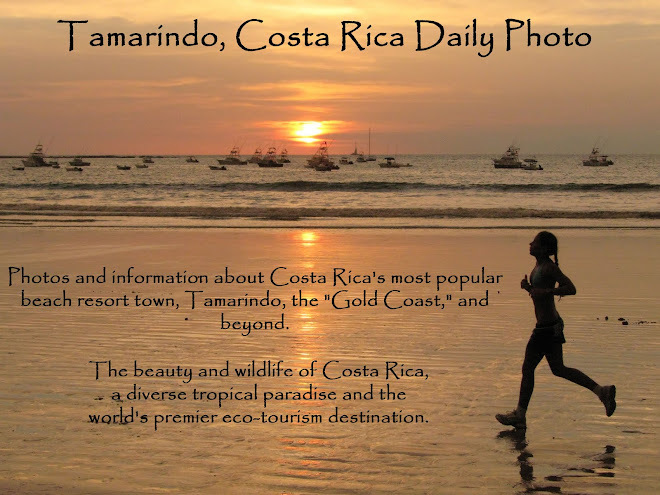 It has broken many stories over the years and is an excellent way for people like me, who spend time in Costa Rica and love the country, but do not live there all the time, to keep in touch with local and regional news while we are away. Sadly and shamefully, I do not speak Spanish, so it is a critical news source for me as reading the Spanish language papers on line would not keep me informed, until I finally learn Spanish, as I am committed to do when I retire. Here is a link to the website for the Tico Times. This overview of Tamarindo shows one of the main intersections in the heart of town, where the large white condominium dominates the skyline, the southern end of Tamarindo beach and bay at low tide, and Playa Langosta in the distance. the tall condo at the top of the photo is the Crystal Sands, which I have shown in the past. The yoga dance studio that I showed yesterday is in the building whose roofline is visible in the front left. The most controversial aspect illustrated by this photo is the effect on the skyline of large condo buildings. I showed one of the anti-development posters on a store in the old part of town a few days ago. The old part of town is under the trees in the right side of this photo. I like that the center of town has so many trees and preserve the small town atmosphere of the area. On the other hand, the development of condos and hotels allows more people to enjoy the area and supports the restaurants, shops, tour guides and jobs in the area. The beach is at low tide. You can see how gradual the slope of the beach is. At the wide part of the beach is the location of the Capitan Suizo Resort. It has a nice restaurant right on the beach, which is hidden under the canopy of the trees. This is a photo of the yoga and dance studio that has a prominent location at the front of one of the main commercial buildings in the middle of Tamarindo. It was closed when I had other business in the building, so I snapped this photo through a windo in the door. I don't do yoga, or dance for that matter. Julie did encourage me to try yoga one time. She promised that there would be other men there. She was wrong. I couldn't do it. I have a bad ankle from an old tennis injury, so I can's stand on one leg. The only part of the yoga that I could do was when we were told to lie down and relax. I fell asleep. Julie was mortified. I told her that I simply did very well at relaxing. Julie took a few steps into a clearing in the jungle, which gave me a clearer shot. Julie had our good camera, and I was using a compact camera with only an auto focus. A photo such as yesterday's can be a challenge because the camera has a hard time recognizing the intended subject upon which to focus. Sharon left a comment yesterday saying that she could not remember from her visit to Tamainrdo where this jungle area is located. It is along the road between Tamarindo and Langosta, on the side of the road away from the ocean. There is a little fitness par course with exercise apparatus, such as a bar for chin ups. A couple of days ago I showed a photo of Julie taking pictures in the middle of Tamarindo. 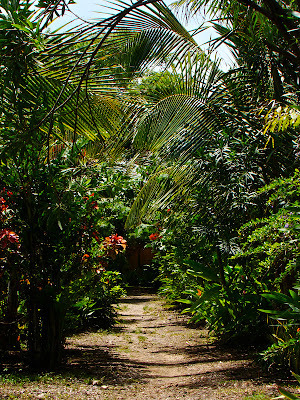 Here is another photo that looks like it is Julie taking photos in the jungle, but this is also in Tamarindo. 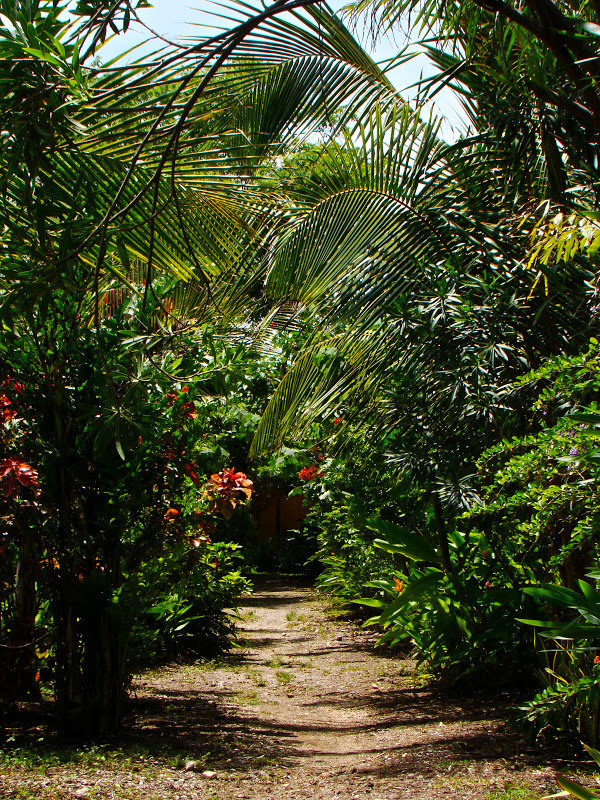 On the road that connects the Langosta area to the main part of Tamarindo, there is a little park with thick woods. Julie took a little stroll into the woods to take some photos. I decided that I would stay up on the road and take some photos of Julie in the woods rather than join her in taking photos of the woods. Today is Sunday, so we have new photos posted on our Viva la Voyage travel photo site this week. This week we are showing photos of the architecture of Khmer temples of Cambodia taken during our visit there this past Spring. This wider view shows the perch of the fisherman that I showed yesterday. He is on one of the rocks on Langosta Beach. It is low tide. At high tide, the rocks will be covered by the waves. I often see fisherman casting their lines out into the surf. I rarely see them haul in a fish. But, I don't have their patience. They must catch fish, because otherwise, why would they do it? My brother lives on a lake in Minnesota, where people go ice fishing in the winter. Ice fishing and surf fishing do not seem like the same sport. If I were a fisherman, I would certainly prefer sanding out by the ocean rather than sitting over a hole in the ice. This week we have photos of Tanzania posted on our Viva la Voyage travel photo site this week. During the past week I have shown photos of a restaurant that will cook your fish, and fishing boats in the bay. It is possible to fish right from the shore, as this person is doing. Like surfers, I guess surf fishermen like to wear colorful shorts. Tomorrow I will show a wider view of the scene where he is fishing. Right after taking the photo of the pottery studio that I showed yesterday, which is also visible in the background of this photo, I snapped this photo of Julie while she was also taking some photos in the old part of Tamarindo. The shops in this photo are on what is called "the circle." It is the end of the beach front road and some of the oldest buildings in town are located here. You can see from the tin roofs that these buildings remain from the time that Tamarindo was a small fishing village that became a hang out for surfers. The little sign in the bottom right of this photo is the logo of a group that opposes the building of high rise buildings in Tamarindo. The old buildings at this location at the heart of the beach would be a prime location for redevelopment. Here is a fun activity. There is a shop in Tamarindo where you can make your own pottery. They also sell the Chorotega pottery that is made in nearby Guaitil. You can take a pottery lesson and make a pot, then return the next day to paint it. You need to plan to enjoy this activity before your last day in town, however, as the process takes several days. Chorotega pottery is one of the few traditions that remain from pre-Columbian culture in Costa Rica. Today, of course, the motifs on the pottery are stylized to appeal to the tourist market. In Guaitil, you can watch artisans make the pottery and buy directly from them. You can also buy the pottery at shops in Tamarindo, such as this one, and from vendors who walk on the beach. As I mentioned yesterday, this is the photo that I originally intended to post for the "Silhouette" theme day, but I decided to post the photo of Julie taking a picture instead. I figured that I would have a hard time explaining to my wife that I chose a photo of pelican instead of her. The telephone lens compressed the space between the pelican and the fishing boat, as you can tell from the large comparative size of the bird. My photo yesterday shows how far out in the bay the boats are moored. I like the silvery sea of late afternoon. Of course, I like the sunsets even better. Today's worldwide Daily Photo them for the first of the month is "Silhouette." This is a photo of a silhouette of Julie taking photos from the main beach in Tamarindo. There are also the silhouettes of the tops of a few of the fishing boats in the bay. I had originally intended to post a different photo for the silhouette theme day, but in looking for that photo I came across this one. I will show the other photo tomorrow, and I am sure you can sympathize that I could not have made a photo of my wife the runner up to it. To see how other City Daily Photo bloggers have interpreted the Silhouette theme for the October 1 Theme Day, use this link.